Good morning Agent Shushanberg. The woman you are looking for is Esther Achoshveroshakov. She is known to be well positioned in the government. We have discovered through our sources in the capital that she has ties to the resistance. Upon learning this we had our man there Mordecai Benyamini on constant watch. Unfortunately he has not been able to make direct contact or turn her to support the opposition. Your mission, should you decide to accept it, is to make contact with Esther and encourage her to influence the King. 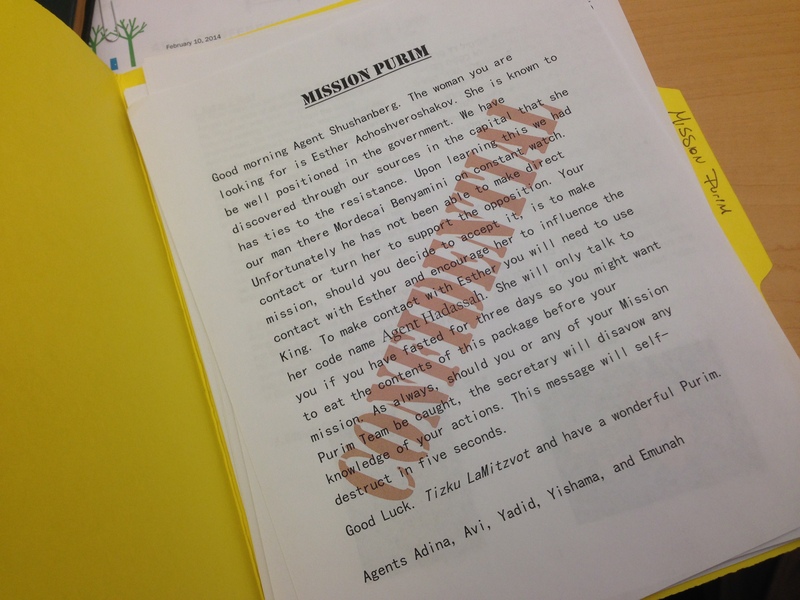 To make contact with Esther you will need to use her code name Agent Hadassah. She will only talk to you if you have fasted for three days so you might want to eat the contents of this package before your mission. As always, should you or any of your Mission Purim Team be caught, the secretary will disavow any knowledge of your actions. This message will self-destruct in five seconds. Good Luck. Tizku LaMitzvot and have a wonderful Purim. There was a lottery to determine the day to kill a people who the king’s number two portrayed as not keeping the king’s laws. Clearly on Purim we were spared and this horrible day was transformed into a day of celebration for the generations, but what about the whole ordeal with Korach? Aaron was person of significance, the brother of liberator of the people, and Moses’s interpreter (foreign minister). One could even say that Aaron like Haman was the king’s number two. Korach came forward and clearly represented a challenge to Moses and Aaron and the law/rule of Moses. While Haman is not swallowed up by the ground, he is hung from the etz– gallows that he built for Mordecai. After putting down the Korach insurrection Aaron might have lost his role as the number two, but instead his staff sprouts and his leadership is rejuvenated. While everyone walks around with a dead tree in hand, Aaron’s power in reinforced as the Cohen Gadol and the staff (etz– tree) in his hand is alive. It seems that the Purim story itself might be a remix of our Korach story, but what do we make of this juxtaposition? Regardless of our perception of God’s presence or absence in the world as the authority, the main story line in history is people want power and want to maintain their own authority. We need to learn to swallow our pride or we risk getting swallowed up by our own ambitions. What are better ways of dealing with our insecurities? Do not leave it up to chance or aggression. I say find a way to get your love at home. A few months back I was trying to explain to my children why I hate Halloween. While I did not want to get into the history of the whole idolatry thing, I was able to explain that it was just not our custom. They thought I said costume, and objected. “But Abba, you love costumes on Purim”. That is true. I do love Purim. Then I got to thinking, why do I love Purim and hate Halloween?